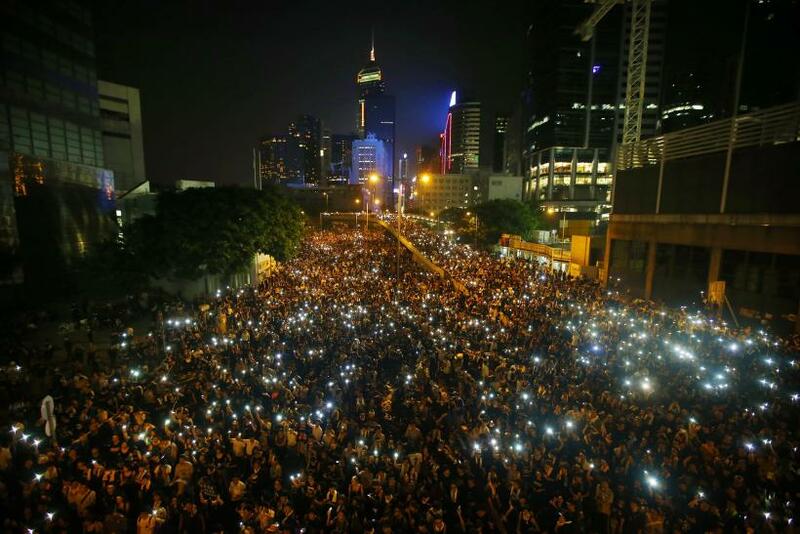 If the Arab Spring was about Twitter, Hong Kong's protests are about FireChat. The mobile app, which makes it possible for users to communicate without a cell or Internet connection, was downloaded 100,000 times over the course of a 24-hour period, its creators say. It’s not clear exactly how many demonstrators are using FireChat, but organizers are recommending that pro-democracy protesters download it in the event that Chinese authorities shutter cellular networks. Protests continued to grow in Hong Kong Monday in what has become the largest demonstration against Beijing in 10 years. Roads were blocked and schools canceled as more people took to the streets in the city to condemn what they perceive as mainland China’s attempt to curb the semiautonomous region’s power for self-governance. There have been no reports of the authorities blocking cellular networks, but some protesters have complained that mobile connections seem to have slowed with so many people congregating together. Micha Benoliel, the co-founder and chief executive of the San Francisco-based Open Garden, which developed FireChat, said part of the reason the app is so popular is because it doesn’t disclose a user’s identity. Unlike cell networks, he added, FireChat actually works better when more users are in a single area. The app connects via peer-to-peer Bluetooth and Wi-Fi Direct connections. FireChat, which was recommended by prominent Hong Kong activist Joshua Wong, works within what are known as “mesh networks,” which grow stronger as crowds grow. In order to stop FireChat, which is not encrypted, police or government forces would have to identify and eliminate each individual point of connection. The technology isn’t the most efficient for everyday instant-messaging, but could be the main method of communication in the event of wider unrest.